The town of Guémené sur Scorff is located in southern Brittany, in the north-west of France. It is an important market town that attracts tourism due to its well preserved and attractive old buildings, many of which were created from parts of the old castle, making them interesting and unique! 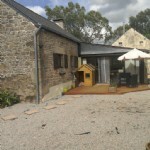 Guémené sur Scorff lies in a lovely area of Morbihan, amongst the beautiful woodlands that cover the countryside here, and within reach of the Atlantic coast. A pretty town centre and an ancient pub! The town is known for its very attractive centre, its superbly preserved and sympathetically restored buildings and especially for its tavern. Les Trois Marchands is a pub which is thought to be one of the oldest in Brittany, and which remains a very popular watering hole today. The tavern serves also as a restaurant and produces excellent food, so be sure to give it a try if you are in town. There are some charming and useful shops in Guémené sur Scorff too, such as the bakery, which sells traditional Breton breads and pastries, and a very charming teashop, perfect for that afternoon break and chat with friends. Don't forget to visit the traditional market too, which offers a real taste of old France. The castle is, sadly, long gone… or rather, most of it is. You can still see the old 14th century gateway, but that is more or less all that is left. Unless, of course, you count the numerous parts of the old castle that are now incorporated into many of the other buildings in the town. If you keep your eyes peeled you may spot a particularly grand chimney pot, or door lintel... well, the French have always been keen on recycling! The town still has an ancient washhouse, typical of the region, and if you go into the baker's shop you will see that they have... and use... the original wood-fired oven. Morbihan is a great area for exploration, and its many character towns and pretty villages positively invite you to get out and about and discover new places of interest. Then, of course, you can enjoy a trip to the coast, which is within very easy reach, or simply delight in the beautiful wooded countryside that surrounds the town. Sportsmen and women will find plenty to do, and the sea with all it offers is a good place to begin. You can sail, swim or sea fish, and when you get bored with all of that you can travel inland to discover golf courses, horse-riding trails and great places for walking and cycling. Brittany has an international at Dinard, and you can fly there direct with Ryanair or Aurigny Air. Those who prefer to travel by boat (and it is always good to have a car so that you can easily explore more of this lovely region) can take the ferry to Roscoff, St Malo or one of the other ferry ports and then drive to their destination. If you are travelling by road, the town is accessed from the N164. Morbihan can be a fairly expensive department, as it combines all that is loved about Brittany with the most southerly location and a better climate. But don't despair even if you are on a tight budget, as the towns such as Guémené that are not located on the coast offer some real bargains. Do you know Guémené-sur-Scorff better than we do? Do you have photos of Guémené-sur-Scorff? Guémené sur Scorff is located in north-western France. It lies in the north-west of the Morbihan department. Access: By air: Fly to Dinard, with Ryanair or Aurigny Air Services. By boat: The nearest ferry ports are that of Roscoff and St Malo. By road: Guémené sur Scorff lies on the D1, and is accessed from the N164. Economy: The weekly market is important to the economy, as is the heritage that brings tourism. Interesting fact: The town is home to Les Trois Marchands, which is one of the oldest taverns in Brittany.